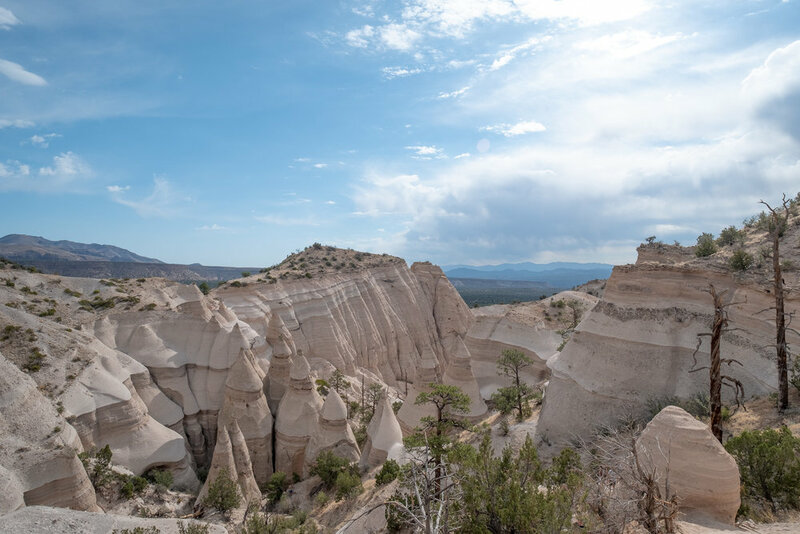 When we started planning our trip to Santa Fe, I did a little research about nearby hiking areas and soon discovered the beautiful Tent Rocks National Monument! I knew we would definitely need to explore this site! There are two (albeit very short) trails you can do. The Cave Loop Trail (slightly shorter of the two) and the Canyon Loop Trail, which is 1.5 miles out and back! We decided to hike the Canyon Loop trail. Kasha-Katuwe Tent Rocks National Monument is an incredible monument located about 50 miles North of Albuquerque, New Mexico. Kasha-Katuwe means "white cliffs" in the language of the Keres Pueblo People (a Native American tribe) in New Mexico. These white cliffs were formed by volcanic explosions that left ash and tuff deposits. Over time, erosion and weather formed these unique rocks that we see today! President Bill Clinton established Kasha-Katuwe Tent Rocks as a U.S. National Monument in 2001. It is located about 45 minutes Southwest of Santa Fe. 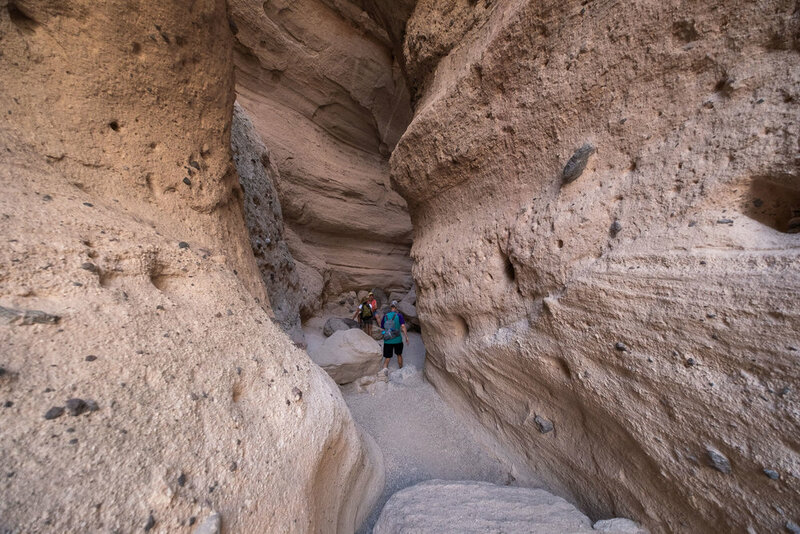 The Canyon Loop trail starts on a flat and dusty trail and then you start navigating through some narrow, (you guessed it) canyons! There are just a couple of spots that are a little technical climbing through the canyons and one spot with a somewhat tricky high step. Mostly, it's pretty straightforward steady climb to the top! You are in the shade a little bit through the canyons, but the majority of the hike is in the sun! Welcome to the desert! From Santa Fe: Head south on I-25 and take the Cochiti Pueblo Exit 264 off I-25 onto NM 16. Turn right off NM 16 onto NM 22, and follow the signs to Cochiti Pueblo and the National Monument. From Albuquerque: Head north on I-25 and take the exit for Santo Domingo/Cochiti Lake Recreation Area (Exit 259) off I-25 onto NM 22. Follow the signs on NM 22 to Cochiti Pueblo and Kasha-Katuwe Tent Rocks National Monument. The GPS is supposedly inaccurate so follow these directions so you don't get lost! Entry is $5 per vehicle. We arrived right as the park is opening, which I HIGHLY recommend. There are not a ton of Parking spots. I read other posts that mention a line starting at the entrance by 9:00. It's the desert, and there is not shade and little respite from the sun. We started the hike around 8:20 and it was already pretty hot when we reached the top. Easy-to moderate, but it is a good little climb. There's just a few areas that are a little technical, but it's nothing crazy. In my opinion, the biggest challenge is the heat and extremely dry atmosphere. I'm used to heat, but high humidity here in Georgia! Sunscreen-the sun is strong, and there is almost no shade. In hindsight, I would have worn a lightweight long sleeve shirt just to protect from the sun even more! Snacks- there is nothing for food nearby the park or in the park, so come prepared with a few snacks on hand! Nothing too crazy, it's not an all day hike, but if you get hungry often (like me), it's a good idea to have a little on hand. Remember to pack your trash in your bag and dispose of it when you get back to a trash can at the parking area. Leave no trace! H2O- Just because it's short hike doesn't mean you shouldn't bring a lot of water. We drank almost all of ours and probably did the hike in about 2 hours! It is very HOT and extremely dry. It is the desert after all! I recommend brining more than you think you need. And if it's later in the day, bring more! ALTITUDE: Your altitude is about 5,570 feet to 6,760 feet (after the climb) above sea level. If you do no live at a place where the altitude is this high do not plan to do this hike the day you arrive! Give your body time to adjust to the dry air and altitude. What helps you adjust? Time and hydration. Proper shoes- Do not attempt this hike in flip flops or even flimsy shoes. You need sturdy shoes, but I recommend either trail running shoes or real hiking shoes with good grip and tread! I can't tell you how many times I've seen people slip and fall because they are not wearing the proper footwear. It makes a difference! Rattlesnakes- this is rattlesnake land so be cautious. Make lots of noise with your feet and don't reach down near any stumps or logs, they like to hang out near those. I always recommend hiking with a friend. Monitor the weather/check the forecast before you go- it could be susceptible to flash flooding in the canyons. I didn't even know about Kasha-Katuwe Tent Rocks Monument until a few weeks before our trip and I'm so glad we got to visit and hike in this amazing place. If you happen to know the pronunciation of Kasha-Katuwe let me know...I couldn't find it anywhere! If you are in Santa Fe or Albuquerque it's definitely worth checking out this National Monument! If you get up early you can easily do this trip in about half a day. Which I recommend to beat the heat! Have you been to Kasha-Katuwe or New Mexico? What did you think! Until next time, happy hiking (and wandering)! Like this post? Share the love and Pin it using one of the pins below!